San Domenico House is a luxurious boutique hotel located only 5 minutes’ walk from Sloane Square and fashionable Chelsea. Bedrooms have en suite marble bathrooms and offer free Wi-Fi. Beautifully designed rooms are furnished with antiques, paintings and classical furniture, collected from around the world. Air-conditioned, rooms feature seating areas, flat-screen TVs and large built-in wardrobes. Molton Brown toiletries and bathrobes are provided in the luxurious bathrooms. Collected by the owners from all over the world, various impressive antiques, paintings and classical furniture can be found throughout the hotel and guest rooms. There is a breakfast, lunch and dinner room service menu and a roof-top terrace is available for exclusive use of the hotel guests. Victoria Station, Buckingham Palace and Hyde Park are all just one mile away. 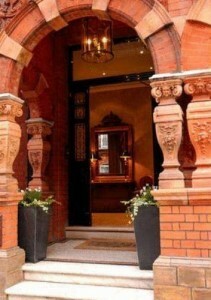 San Domenico House is just under 20 minutes’ walk from Kensington and world famous Harrods.